There’s been a resurgence in the last few years involving lightweight, flat-based stands. 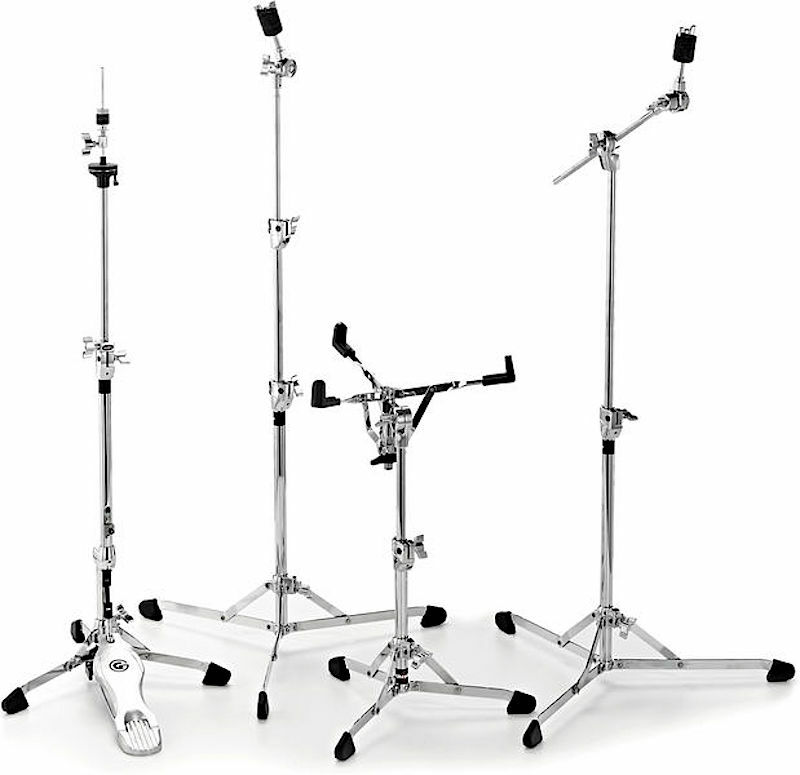 Gibraltar’s take on this has included both straight and boom cymbal stands, a snare stand (which wasn’t available for the video) and a hihat stand. I’ve been using flat based cymbal stands for a while, albeit from a different manufacturer. I like the fact they are quick and easy to set up and, of course, lightweight. This single aspect alone really did make a noticeable difference to weight of my hardware case. The cymbal stands we tried for the review were sturdy and yet didn’t take up a lot of floor space. They seemed to adequately and securely hold the compliment of [fairly large] cymbals we tried on them. We had no positioning issues and they extend to a good height as well. One thing I do like with Gibraltar’s offering though, is the boom cymbal stand. I’ve found through my own use of lightweight cymbal stands that the only thing I really miss is a boom option (which isn’t currently offered by the brand I use). The Gibraltar boom stand was great to use, and with proper placement of a leg to accommodate the cymbal weight, it was wonderful. The hihat stand was solid and smooth. Because of its design, it’s potentially not quite as accommodating as more regular stands in terms of potential footplate adjustability, but then again, arguably it’s not intended for overly heavy [foot] action anyway. The snare stand is compact but sturdy. The basket utilizes a ball joint for universal positioning options which is helpful. 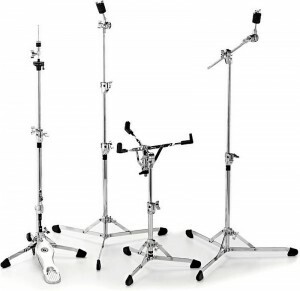 While the height is obviously adjustable, this may affect the stability if the snare drum is particularly heavy. While I didn’t gig these stands, I certainly would have been happy to. Unless you’re a particularly heavy hitter there’s probably something for everyone here. Price-wise, these fit nicely somewhere in the middle of what’s available in the market and of course, reduce the weight of your bag at the gig. They’re available as packs or individually. The Gibraltar Stealth G Drive single bass drum pedal is a double chain drive design with quick response rocker hub spring assembly and an aluminium base plate (with drum key), in an almost all black finish. 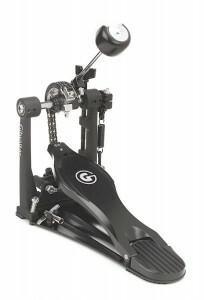 A unique feature of the pedal is the hoop clamp tightener placement, which instead of being underneath the pedal board is on the top of the frame for extremely easy access. The pedal board height adjustment is independent from the spring tension or beater angle. Also included is a dual surface black and chrome 90 gram beater. The pedal is smooth and the beater delivers a strong punchy. The black look is pretty cool too.